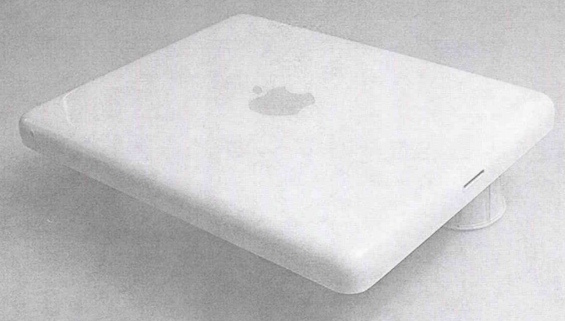 Just saw this article on AppleInsider where a photo of one of the original apple tablets prototypes is shown. Quick story about my very brief interaction with this thing. Although the article says that it may have been developed sometime between 2002 and 2004, I’m almost positive that the date I saw it would have been late 2004 at the earliest and more likely 2005. They brought a few of us from the pro-apps group – UI- and Product-Designer types – into this little windowless room in Cupertino and there was a cardboard box sitting on the table. Once they were sure the door was locked and they made it very clear that everything we were going to see would not be discussed outside of this room, they lifted the box off to reveal something that looked very much like what’s shown in the photo above. Pretty much the same footprint as the then-current 12″ Aluminum PowerBook G4 but thinner and with the white polycarbonate case. The reason we were being brought in to talk about it was because they wanted to get people coming up with a variety of multi-touch gestures that might be useful. One of the guys in our group (whom I won’t mention by name since he still works there) spent a bunch of time generating cool ideas that were then fed back into the secret machine. It also shows how they were already in the process of generating patents on multi-touch gestures. Interesting to note that this must have been right around the same time that Apple acquired Fingerworks. Pingback: ERIC ALBA | Ron Brinkmann on those Apple Tablet Prototype pics.